This is the second installment of a new Lazy Scholar feature, pairing news items with historical archives. • Slate‘s TV Club is diligently following and debating the new season of Mad Men. If you haven’t watched (is that possible? ), it’s a 60s scholar’s dream, with carefully reconstructed interior design, fashion, and, yes, language. A few weeks back, Ben Zimmer at the New York Times Magazine offered an inside look at the writers’ efforts to keep the dialogue historically accurate. Scholars of advertising and consumerism, of course, will be thrilled, too, even if the show fictionalizes the origins of many real-life advertising campaigns. Sorry folks, Don Draper did not coin Lucky Strike’s slogan. People were enjoying their “toasted” cigarettes as early as 1919, as this ad shows. Until next Sunday night, you can ponder more of the history behind Mad Men by checking out the beautiful exhibit, The High Art of Photographic Advertisement, thanks to Harvard Business School’s Baker Library. 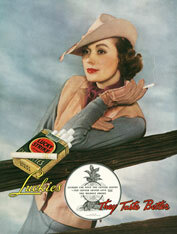 One wonders, were those “Luckies” even more tempting in color? • Moving on to the big screen, top critics are divided about Eat, Pray, Love, Ryan Murphy’s adaptation of Elizabeth Gilbert’s bestselling memoir about her post-divorce trip to Italy and elsewhere. You can follow the globe-trots of some earlier American women courtesy of Brigham Young University’s American Travelers in Italy archive, with digitized copies of travelogues by Sophia Hawthorne, Margaret Fuller, and Louisa May Alcott. The Little Women author had this to say about Rome: “Felt as if I had been there before and knew all about it. Always oppressed with a sense of sin, dirt, and general decay of all things.” Not exactly the stuff of summer movies. • Officials and locals in Louisiana debate whether it’s safe or wise to re-open commercial fishing grounds after the Gulf oil spill. Between 1921 and 1932, LA Department of Wildlife and Fisheries employee Percy Viosca, Jr., documented the state’s coasts, and captured many photos of its fishing industry. You can view images like the one below on the Viosca Collection from LSU. • Speaking of fashion, this just in: Urban Outfitters’s fall catalog was shot entirely in and around my adopted summer home, Northampton, Massachusetts. Have the grounds of Smith ever looked so co-ed? You can download the catalog here. And you can see historical images of Smith here, thanks to the college’s library. 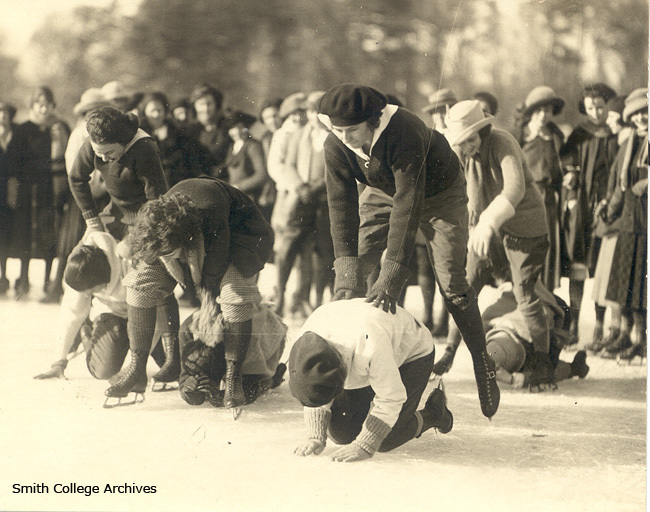 Below, some ladies play leapfrog on the ice for the Sophomore Carnival of 1922.